Home Uncategorized Desperately Seeking A Season: Where To Spot Autumn In L.A.
Raise your hand if you left home this week expecting an otherwise normal, crisp November day and were ambushed by a Los Angeles Autumnal oven? Yep, we had a mid-November heat wave. Given the recent temps, it is easy to forget what season we are in, but Thanksgiving is around the corner, and quick switches from forty to eighty degrees is how our city typically gives a pre-Wintry hello. When it comes to fall in L.A., I’ve been asked before if there are any places where leaves actually hit the ground. Could you find a leaf pile to jump in? You could! I’ve seen them, and they are worth sharing. So, despite a hot weathered week, here is a handful of spots where foliage collects under cars and on unkempt lawns, places you could easily mistake for being in New England. A note: My criteria in putting this list together was simple: leaves have to be downed. I’ve made a few exceptions for places with a uniquely L.A.-this-time-of-year magic to them. Each and every one will put you into the fall mood. Surprisingly, parks in Los Angeles are distinctly not Autumnal because they are constantly cleaned. You learn this by actively hunting spots where leaves have fallen, arriving at parks only to be bummed out by ironic, evergreen palms. The Fairfax Branch Library and Pan Pacific Park are exceptions in that they and the area surrounding them—specifically Vista between Beverly and 3rd—are a yellow haze thanks to downed golden leaf buddies. The area’s mix of Spanish architecture and Grove shoppers reminds you that you haven’t left L.A. I recommend grabbing brunch at BLD and then roaming this area, leaf hunting. 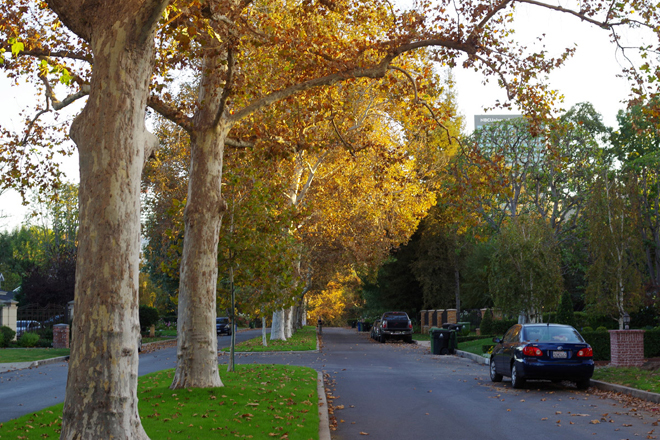 The majority of L.A.’s fallen leaves will be found in neighborhoods. There’s no way around that. This is because residents, incurring an onslaught of leaf rain, can only handle so much. Raking is annoying! Thus, many streets are left covered in tree sprinkles, something that is great if you are suffering from a lack of fall-ness. The hidden Toluca Estates and area surrounding the Lakeside Golf Club are covered in downed leaves. Toluca Estates are particularly special as amber leaf covered trees line the street. You can spot the NBC Universal building in the background—how L.A. is that? Keep in mind this is a residential zone: park and walk from the pine filled South Weddington Park to the Estates. Get ready to see some beautiful houses, too. While many think the Huntington Gardens are the spot for leaf gazing, the place is a bit too well kept to actually indulge in fall. But the L.A. Arboretum? They do nature naturally, letting trees go crazy on the grounds. Moreover, they’re totally embracing being a botanical, Autumnal destination. Have you seen their Facebook? It’s full of photos of red, green, yellow, and orange leaves, a seasonal paradise! Of all L.A. parks, Ferndell is the most natural in that leaves are falling everywhere and no one knows what to do about it. It makes for a great way to start a Griffith Observatory-bound hike. That said, I recommend you turn west for your hike, starting in Ferndell and then walking the streets of circuitous hilltop neighborhood The Oaks, which—you guessed it—is full of leaf losing Oak trees. If walking around isn’t your speed and you want to go on a trans-Los Angeles road trip, get yourself to Mullholland Drive. This mountain ridge road gives you a great survey of L.A. in Autumn with all sorts of trees, homes, and local points of interest (Laurel Canyon Dog Park, Universal City Overlook, Dead Man Overlook, Tree People). If you want to take your time, start at Mullholland and Ventura and crawl to the road’s end at San Vicente Mountain Park. For a more abbreviated trip, start at Ventura and head south or north at Laurel Canyon, both great routes for post-drive lunch and shopping stops. This beautiful and elegant Old Hollywood, off-Wilshire venue is surrounded by red leafed trees ready to drop their coverage when a strong wind kicks up, making it a great Mid City spot for enjoying the season.